“Drop dead, traitors!” wrote one Facebook user. “Stop swindling money from gullible supporters,” said another. Further down the comment thread, the Photoshopped picture of a young man with a noose tied around his neck received dozens of likes. “Your corpse will rot on the street and we will celebrate!” the caption read. 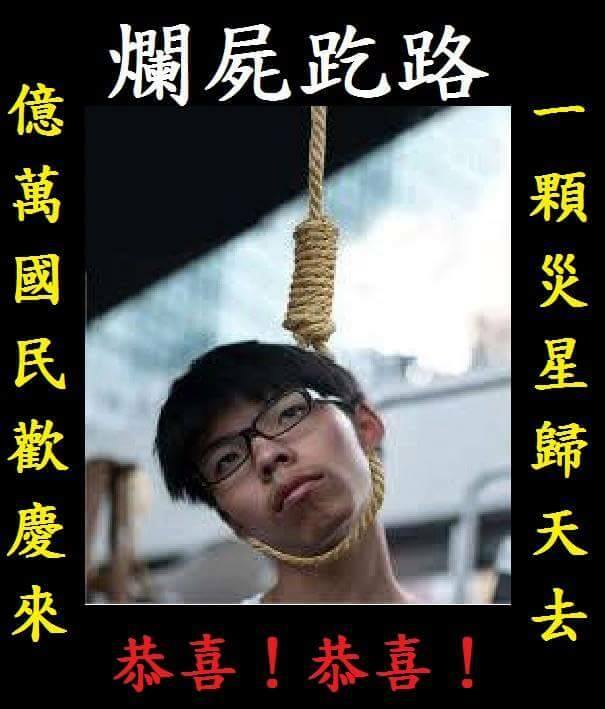 The lynching victim depicted in the picture was Joshua Wong (黃之鋒), the once-idolized student leader who, at the tender age of 14, led tens of thousands of citizens to thwart the government’s attempt to introduce a patriotic education program. The darling of foreign news media appeared on the cover of Time’s Asia edition and was named one of Fortune magazine’s top 10 world leaders in 2015 alongside Pope Francis and Apple CEO Tim Cook. There were even whispers that he should be nominated for a Nobel Peace Prize. But what a difference a year makes. Today, he is the prime target of what amounts to Cyber-bullying. Thousands of blistering comments plaster across Wong’s Facebook page and that of his newly-minted political party Demosistö (香港眾志). The trolling – the Internet slang for online harassment – is so relentless, and the name-calling is so vicious and disruptive, that you easily forget what the original post is about. In reality, most of the online commentary is less than constructive. The trolls, who never fail to respond within minutes of a new update, go by aliases like Billy Bong and On Dog Joshua (“on” is an expletive in Cantonese meaning “moronic”). At the same time, there is no shortage of keyboard warriors who use their real accounts under their real names. 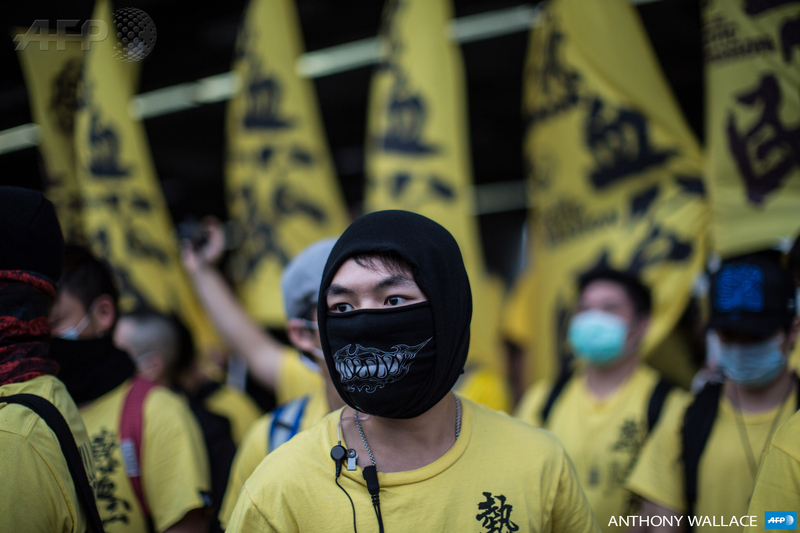 The vast majority of them are diehard supporters of localist parties such as Hong Kong Indigenous (本土民主前線) and Civic Passion (熱血公民) – radical splinter groups that call on citizens to use “any means necessary” to resist the Sinofication of Hong Kong and ultimately declare independence from Mainland China. While Wong bears the brunt of the vitriol, he is by no means the only target. Fellow Demosistians such as Nathan Law (羅冠聰) and Oscar Lai (黎汶洛) also find themselves in the cross hairs of the ad hominem offensives. Last week, when Wong and Law embarked on a North American university tour – Wong was invited to speak at Harvard, Yale and M.I.T., among others, while Law focused on Stanford, Berkeley and other West Coast colleges – the attacks reached a fever pitch. The troll army sneered at their “paid vacation” and called it “shameless self-promotion” and an “embarrassment to Hong Kong.” “Who the f** gives you the right to speak for us?” one asked, before a chorus of assailants joined in for an online free-for-all. “The purpose of the trip was to spread the word about our political situation and rally international support for the self-determination of Hong Kong,” said Law over the telephone, hours before his scheduled flight from San Francisco to Vancouver for a speaking engagement at the University of British Columbia, the final stop on his week-long tour. “We didn’t do any fundraising for Demosistö, and all travel expenses were paid by the universities that invited us,” he added. The spat between the student leaders and the localists goes way back. During the OccupyMovement of 2014, Wong and the Hong Kong Federation of Students (of which Law was a core member) had constant run-ins with various splinter groups. Four days into the movement, Wong held an anti-government rally outside the Golden Bauhinia Square where the National Day flag-raising ceremony was to take place. 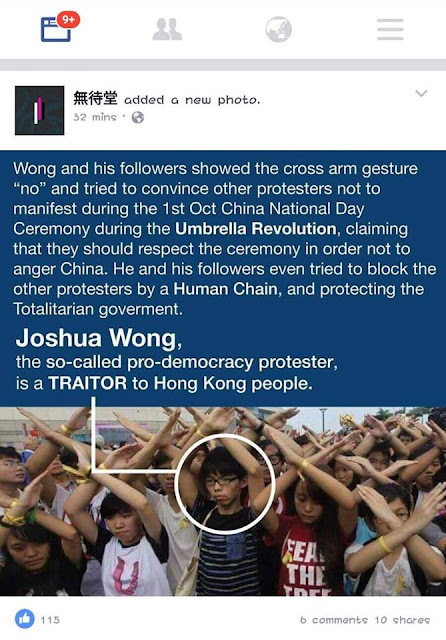 Wong and his Scholarism followers were accused of forming a human chain to sabotage the attempt by a legion of firebrand protesters to storm the square to disrupt the event. And snowballed it has. The National Day ruckus was followed by similar incidents throughout the 79-day street occupation, in which localist groups challenged the legitimacy of Wong and HKFS leaders to make decisions for protesters and slammed them for standing in the way of escalation plans. But it gets worse. 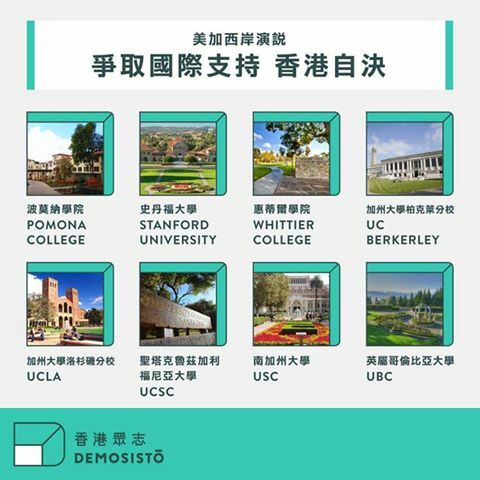 In the eye of the localist sympathizers, the recent rebranding of Scholarism into Demosistö has turned Wong and Law from ineffective leaders to political rivals – and even election spoilers. That Demosistö and Hong Kong Indigenous will be going after the same voter base – the young, progressive vote – in the September general election has added fuel to the raging fire. That also explains why localist supporters have been going after the new party with more ferocity than they do their declared enemy: Communist China. Until recently, the trolling had been one-sided, and the Demosistians had not hit back. Two weeks ago, however, Wong made the mistake of responding to a supporter of Edward Leung (梁天琦), spokesman of Hong Kong Indigenous. The supporter had left a Facebook comment criticizing Demosistö’s $2 million fundraising campaign. Wong defended his solicitation of small online donations with a short reply: “We don’t want to court secret benefactors,” implying that Leung’s party is funded by a dubious financial backer. 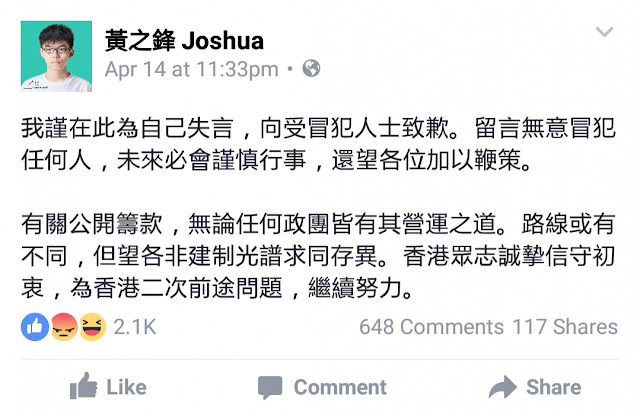 Wong’s regrettable remark was political red meat for the trolls, and the teenager was slaughtered on social media for leveling an unsubstantiated attack against Leung. The next day, Wong issued a public statement on Facebook apologizing for his gaffe. Not surprisingly, the apology was not accepted; it has fired up his critics even more. As much as Wong and Law try to take the flak in stride, personal insults still sting. The phenomenon underscores the toxicity of local politics and the severe polarization of society in the post-Occupy era. Anger and frustration have boiled over, and once-political allies can become sworn enemies over the slightest of misunderstanding or disagreement. 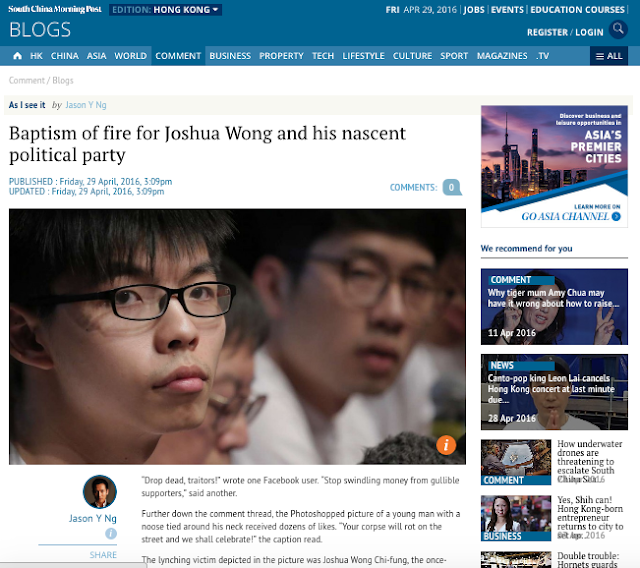 This article appears in the South China Morning Post under the title "Baptism of fire for Joshua Wong and his nascent political party."